There are now a dozen different types of medications to treat diabetes, several of which require self-injection by the patient (or a care-giver). The injectable diabetes drug that almost everyone is aware of is, of course, insulin, but there are several others: a drug called pramlintide, plus several drugs in the category called "GLP-1 receptor agonists", and most recently, diabetes drugs that can be injected once-weekly (which are also in the category of GLP-1 agonists). The first of the non-insulin injectables for diabetes, pramlintide (brand name Symlin), has been available since 2005. It's approved in the US only for people who are already taking insulin, and who have "failed to achieve desired glycemic control despite optimal insulin therapy" (which the label doesn't define). That's a pretty small group of people, and to make matters worse, it should be given at mealtimes (when insulin is also frequently given), has to be given as a separate shot, and it has a definite risk of severe hypoglycemia. Which patients might benefit from it? 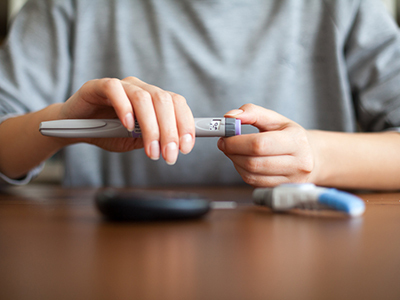 According to a 2005 press release, it provides an "option for many patients who, despite their best efforts with insulin therapy, continue to struggle to achieve their glucose control targets. These patients often experience weight gain and continued high blood sugar after meals." The press release also pointed out that studies showed that it "helps patients achieve lower blood glucose... after meals, leading to less fluctuation during the day, and better long-term glucose control (A1C) compared to patients taking insulin alone. In these studies, patients used less mealtime insulin and also had a reduction in body weight compared to patients taking insulin alone." If you are a patient already taking insulin, and having problems with continuing high blood sugar, it might be an option. But there are multiple new ways to treat diabetes that have been developed since 2005, including other injectables, and the pool of people who should consider starting pramlintide should probably be restricted to folks who are on insulin, have high sugar, can't take other oral or injectable diabetes medications for whatever reason, and who are under the care of a diabetes program and still don't have decent glucose control. The first drug in an entirely different class of injectable diabetes drugs also became available in 2005. This drug, named exenatide (brand name Byetta), is indicated for T2D patients only, and has fared somewhat better in the marketplace. Exenatide is the first drug in the class called "glucagon-like peptide-1 receptor agonists" (or GLP1 agonists), and has a side effect that may explain part of its success: weight loss. Exenatide, which requires two injections daily, later had competition from other GLP1 receptor agonists, such as once-daily liraglutide (Victoza) and more recently, others named lixisenatide (Lyxumia, available in Europe but not in the US) and once-weekly albiglutide (Tanzeum). There has been some concern over the safety profile of the GLP-1 agonists due to effects in the pancreas, as they may cause pancreatitis or other pancreatic problems. They also frequently cause nausea and other gastrointestinal side effects, which usually resolve over time. There's also a worry that these drugs might cause an unusual form of thyroid cancer, called medullary thyroid carcinoma. The novel idea of treating hyperglycemia with a drug that only needs to be given once a week has finally found success with the GLP-1 agonists. Long-acting forms of exenatide (brand name Bydureon), albiglutide (Tanzeum), and dulaglutide (Trulicity) are now approved, and others are on the way. The side effect profile of these once-weekly GLP-1 agonists seems similar to the daily versions, and the convenience factor of only giving an injection once weekly seems self-evident. Who should get a GLP-1 agonist (either daily or weekly)? One set of guidelines have recommended using them as third-line agents in obese T2D patients who do not meet glycaemic targets on a combination of metformin and a sulfonylurea. The key here is that they may assist the patient in losing weight. The convenience factor seems to weigh in favor of the once-weekly versions of these drugs. And it should also be pointed out that the doses of the GLP-1 agonists is the same from dose-to-dose, and doesn't vary all over the place as do the doses of insulin. So, if you are a T2D patient with inadequate BG control on your present program, and would prefer the possibility of weight loss associated with the GLP-1 agonists instead of the weight gain that's so common with insulin, these injectable medications are worth discussion with your diabetes physician.